Bouneschlupp is a token Luxembourg soup and there are as many versions of Bouneschlupp as there are Luxembourgers, I find. Some add cream, others prefer wine, some add sausage, and others like to keep it vegetarian. The base is always the same though: onions, beans and potatoes in a brothy soup. 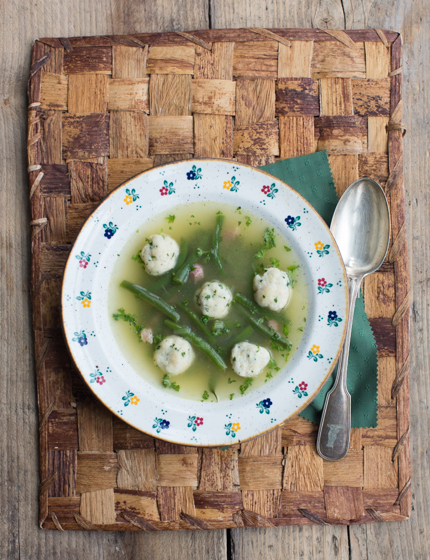 In Germany, people often add starchy Knödel to their soups, which I like a lot. So when I devised this recipe I thought why not leave out the diced potatoes and add Knödel instead! But not just any Knödel, oh no! This recipe comes with amazing cream cheese dumplings. Totally yum! I made this Schnitzel in the first Berlin episode of my show, you can watch it here. If you want the recipe in Luxembourgish, click here. Start by preparing the dumpling dough: Mix the cream cheese, butter and egg yolks with a fork until smooth. Add the breadcrumbs, parmesan, flour and parsley and season with nutmeg, salt and pepper. Refrigerate for 30 minutes. Peel and finely chop the onion. Heat the butter in a large saucepan and fry the onion and the bacon lardons for 4 minutes until the onions are soft. Dissolve the stock cube in 1.2l hot water. Add to the onions with the bay leaf and the summer savoury. Cut the green beans into bite-sized chunks and add to the stock. Bring to the boil, lower the heat, cover the soup and let it simmer for 8 minutes. Peel and finely grate the potato. Add to the soup after 8 minutes, cover and continue to simmer for 5 minutes. Sprinkle the parsley into the soup and set aside. Prepare the dumplings: using your hands, shape the dough into approximately 20 walnut-sized dumplings and put them on a plate. Bring a pot of salted water to the boil, then lower the heat so the water is no longer bubbling. Add the dumplings and cook until they float to the surface, then simmer for another 8 minutes. Remove the dumplings with a slotted spoon. Reheat the soup and distribute between four plates, adding a few dumplings to each portion. TIP: For a veggie version you can leave out the bacon lardons. For a creamier version, you can add 50ml of cream to the finished soup.